Attitudes to public drinking in Italy seem to be more lax than in most other places I’ve been to. This is hardly shocking if you remember that we’re talking about a wine-exporting Mediterranean country, but still, what you can matter-of-factly do here may very well surprise your typical New Yorker. 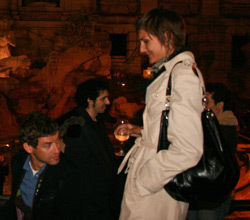 One example: during the last Rome expedition of this site’s core group of contributors (which neatly coincided with Ree’s ?th birthday), we got it into our heads to finish our last evening together with a glass of champagne next to the Trevi Fountain. No problem! Some time around midnight Alban (who was the principal author of the idea) boldly walked into a Castro Pretorio-area bar and demanded a bottle of champagne and four glasses “to go”. Not an eyebrow went up behind the bar (which led me to conclude that such requests are fairly typical) and a few minutes later we were sitting in a cab happily clutching our newly acquired champagne flutes. As the cab dropped us off next the fountain, I noticed two nearby police patrol cars parked strategically to observe the fountain. Although the piazza was still relatively lively, few tourists remained and we were able to sit right on the edge of the fountain. I must say I hesitated for a moment before uncorking the bottle, but Alban assured everybody no taboos were being broken and so we poured the sparkling liquid into our glasses and toasted Ree. 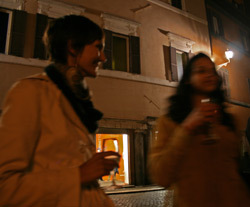 Alban was right: drinking next to the city’s monuments wasn’t such a big deal for Roman police – at least, they didn’t say or do anything. Granted, we kept it fairly civil – we didn’t yell or throw glasses in the fountain and didn’t even attempt to imitate Anita and Marcello. Still, everybody’s nonchalance kind of impressed me, as I felt it wasn’t the result of negligence but rather a manifestation of a “live and let live” mentality. So here’s to the great culture that allows such wonderfully silly things to happen! P.S. Obviously, this article doesn’t constitute legal advice. It’s very possible that a formal ban may actually exist – either at the national or municipal level. However, I spent about two hours researching the subject and came up with nothing more than restrictions on drunk driving and alcohol advertising, so I seriously doubt anything else exists in Italy.